There was no grant support for this work. The IRB at the Davenport University approved the protocol for this study as exempt. Background: As part of a capstone course, Doctor of Physical Therapy (DPT) students created visual art projects to gain a deeper understanding of how physical therapy (PT) transforms society and improves quality of life for patients. These creative works were displayed in a public art show to engage and educate the community about PT. The purpose of this study was to examine the influence of an art show on professional beliefs of DPT students and on the local community’s understanding of the physical therapy profession. Methods: Community-based participatory research (CBPR) methods incorporated phenomenological methods to examine lived experiences of DPT students staging an art show and the audience of attending community members. Students completed a questionnaire (n= 40) about their experiences and community members reflected in a journal guest book (n = 30). Data were analyzed for common themes and coded into categories. Results: Students reported initial skepticism about the art show. The art experience was challenging, but helped students confirm a calling to the profession. Students reported learning new ways of thinking and communication through art to promote the PT profession. The community members reported gaining a better understanding of PT as a profession and feeling a deep connection to PT through the art show. Conclusions: Art provides opportunities for creative and unique perspectives of thinking about familiar subjects. The PT art show provided students with new ways to problem solve and alternative methods of expressing the essence of their beliefs about transforming society. 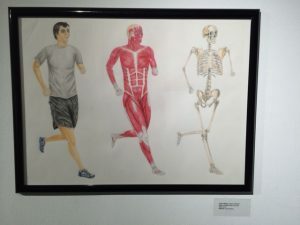 The community learned about the work of physical therapists through these creative projects and both students and community members were surprised by the power of art to connect them. All healthcare professionals, including physical therapists (PTs), encounter human suffering in their everyday practice as healers. Human suffering can raise fundamental questions related to health, wellness, illness, disability, life or death, and grieving. These questions challenge practitioners who have been educated on behavioral objectives based on traditional cognitive, psychomotor, and affective domains of learning1 to provide adequate and compassionate care for their patients and families. To make situations more challenging, PTs may encounter ethical dilemmas when dealing with patient-practitioner interactions within the healthcare system.2 Physical therapists need to respond properly to situations involving ethical issues as well as manage the distress characterized by human suffering. Traditional classroom environments where the skills and science of physical therapy are taught often fall short in pedagogy to engage students in the three domains of learning (cognitive, affective, psychomotor) within the clinical context.3 Students may cognitively understand how to physically respond to difficult situations but the deeper connection to the heart of distress, and how to respond, often cannot be taught through traditional pedagogical processes. Medical humanities (MH) and health humanities (HH) are tools to help students develop the ability to communicate about difficult topics while also nurturing skills of observation, creativity, imagination, intuition, empathy and self-reflection, all crucial to holistic practice in healthcare.4-17 Defined by Hurwitz in 2003, MH involve the use of literature and the arts as a means of exploring and discussing human issues pertinent to the health professional.18 The term HH has been coined to represent a broader, more inclusive population of health professionals rather than just those studying medicine.19 This study examines the influence of an art show on professional beliefs of students and on the local community’s understanding of the physical therapy profession. Two hypotheses guided the questions for this investigation: 1) Doctor of Physical Therapy (DPT) students involved in the HH through visual arts will demonstrate a greater understanding of how physical therapy may transform society; and 2) community members will obtain a greater understanding of how physical therapy improves the human condition through the experience of an art show. The American Physical Therapy Association (APTA) developed a new vision statement in 2013, stating physical therapists are active in “transforming society by optimizing movement to improve the human experience.”20, 21 Principals involved in this new vision statement were meant to inspire the profession and members of society. Eight guiding principles inform the APTA vision statement: identity, quality, collaboration, value, innovation, consumer-centricity, access/equity, and advocacy. Vision statements regarding a deeper connection to society are lofty, but they often beg the question: How does a profession bring that vision to reality and connect with society? Insights from HH allow students and the community to view lived experiences from the eyes of the other and gain new ways of seeing possibilities for reaching full participation in life roles.6 Middleton and Drucquer11 discuss using an artist’s view as a means to approach patients through multiple lenses to adapt to challenging situations. The artist’s view may allow the healthcare practitioner to demonstrate improved human interaction and better pattern recognition skill when diagnosing patients. In addition, the visual arts can aid in self-care of the practitioner. After a long day of stress, patient-practitioner interactions and strategies of engaging with visual arts may lead to improved coping skills.11 Kirklin et al8 suggest that visual arts-based observational skills correlate to improved observational skills of doctors and nurses in determining when to refer patients with skin lesions to dermatology, thus ultimately improving patient-practitioner relations and overall care. Macnaughton10 suggests that the healthcare practitioner as artist seizes an opportunity for greater creativity in providing care, improving the human condition of both the patient and the practitioner. The marriage of science and art is not new. In his history of medicine, Porter23 points out that the ancient Greeks emphasized the common ground between philosophy, medicine, and ethics. With the increased emphasis on evidence-based practice in physical therapy and medicine, the humanities and arts have been relegated to a lesser position. Yet, the essence of the patient and practitioner experiences may not be measured solely through numbers using positivistic approaches to research.24-28 The artist’s view of the world emphasizes common ground in society by providing insights into fundamental issues regarding human existence, including death and dying.11 The visual arts provide the community with a stage to learn about a profession and possibilities for improved function and transformation. While there is much literature on the use of HH in the preparation of physicians, nurses, occupational therapists, and others such as emergency medical technicians, a paucity exists regarding the role the visual arts might play in physical therapist education. There was also no evidence in the literature about how the visual arts influenced the education of the community on the roles of physical therapists. This study attempts to fill those gaps in the literature. To address the purpose and hypotheses of this study, community-based participatory research (CBPR) methods incorporate a phenomenological survey to examine lived experiences of DPT students staging an art show and community members attending the show. CBPR involves “a commitment to conducting research that shares power and engages community partners in the research process and benefits the communities involved, either through direct intervention or by translating research findings into interventions and policy change.”29 (p.4-5) More than a collaborative approach, CBPR involves building trust and sharing power through all phases of conceptualizing the research problem, conducting research, and disseminating findings.29 All parties learn from the process. Results from a CBPR project may not necessarily be disseminated as a peer-reviewed research paper, but may also take on some other form of education within the community. For this research project, the DPT program was approached by the university to consider ways in which the university and greater community might learn about the physical therapy program at the university. A professor in the DPT program had preliminary discussions with an art professor who was planning to host an art show in the fall. A partnership was formed between the DPT program, the university, and the greater civic community resulting in an opportunity for the DPT program to share the message of physical therapy identity with the community through the shared time and space of an art show. An opportunity for the DPT program to display visual art describing the intersection of the International Classification of Function (ICF) model and the new APTA vision statement was established. The study was approved by the IRB with exempt status at Davenport University in Grand Rapids, MI. Inclusion criteria included being a DPT student enrolled in a Critical Integration course in the last year of the DPT curriculum in a Midwestern university. For community members, inclusion criteria included being in attendance at the art show. Adding comments to the reflective journals implied consent of the community members and no names were recorded. A sample of convenience was used in this study. After staging the art show, DPT students (n=40) were invited to write confidential reflective papers about the experience of creating art as part of the curriculum in the DPT program. Community members (n=30) from the local university and civic community were invited to attend the art show through a newspaper announcement and university communications. These community members had the opportunity to reflect on thoughts, feelings, and lessons learned about physical therapy as a result of attending the art show. Table 1 lists the type of visual art on display by medium and title. Reflective writing prompts for students and community members are listed in Table 2. What were your thoughts when you first heard you had to create a piece of art to represent the intersection of the ICF model and the new vision for PT (Transforming society through optimizing movement to improve the human experience)? What were your thoughts when bringing in your art to display? How did you feel as we were staging (setting up) the show? How did you feel on the day of the art show? What was it like to have people view your work of art? What did you learn about your classmates? What do you believe the community learned about PT? What did you learn from the art show experience? How did the art show make you feel? Third-year students in the program were asked to create a piece of art for an art show being staged to celebrate Physical Therapy Month in October as part of a Critical Integration DPT course in the last year of the curriculum in a Midwestern university. The theme of the art project explored the intersection of the World Health Organization (WHO) ICF Model30 and the new vision statement for the American Physical Therapy Association (APTA) which states physical therapy has a role in “Transforming society by optimizing movement to improve the human experience.”20,21 The ICF model moves beyond a medical diagnosis and utilizes a more holistic approach to examine a person’s participation in societal roles despite potential medical diagnosis, functional and activity limitations, as well as environmental and personal contexts which either promote or limit participation in life roles. Students created paintings, sculptures, poems, photographs, flipbooks, collages, or other works of art to express intersection between the ICF Model and the APTA Vision Statement. Several reflective journals were made available for community member guests to record their thoughts while attending the art show. These handwritten reflections were transcribed for analysis. No names were attached to journal reflections of the community members. The reflective papers from students and transcribed comments from the community were analyzed for themes and a common description of the experience was created. Forty responses were provided from the student artist group and 30 were obtained from community participants. See Figure 1 for the research process used in this study. The reflective papers from the student artists and the written community reflections were analyzed using a descriptive phenomenological approach described by Giorgi27,28 and Dahlberg, Drew, and Nyström.26 This process involved a whole-parts-whole-type holistic examination of the interview texts until constituents or themes of the experience were revealed. Each reflection by the student artists was read two times with the intent to become familiar with the overall tone, word choices, and phrasing. The third reading attended to the flow and structure of the text created by the student artists and main segments of the community participants’ writings were outlined. On the fourth and final reading, key descriptive words or phrases were identified. Important phrases and lists of common elements were used to create a summary of the experience for each participant. Identities of the reflective paper authors were confidential to the primary investigator but anonymous to the other researchers on the team. The research team collaborated to summarize the essence of the experience with the themes generated by this process. The researchers created a narrative summary and a thematic summary for each participant. These themes were emailed to the student artists who were asked if the interpretation matched the way they lived the art show experience and if the researchers misunderstood or misrepresented anything in the interpretation. Without the participants’ ultimate approval, any descriptions or interpretations of the research team would be inadequate and possibly biased. This process served as a vertical analysis for each reflection received from the student artists. A similar process for completed for the community member reflections. 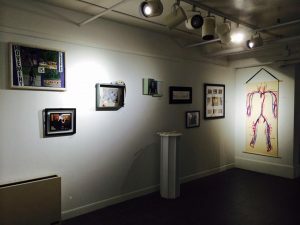 Since the authors of the community writings were anonymous, the common narrative summary and themes were shared with community members who attended the art show after the opening night, but who did not provide reflective writings. Finally, a horizontal analysis across all written reflections was completed to develop the common description of the experience of staging an art show by the DPT students. Once this process was completed, a summary of the common description and themes across all reflective writings by student artists were shared with the students for review to determine whether or not the common description resonated with the experiences of the student participants. This process also helped ensure dependability and credibility across all student reflections through the member checking process of the common themes. A similar process was used to analyze reflective descriptions of the community members attending the art show. This common description summary was shared with community members who were not a part of this study and did not attend the art show. Saturation was reached by community members after receiving comments from 10 individuals. This process was done to solidify credibility and trustworthiness of the description for the community experience. Methodological rigor is as important in phenomenology as in other forms of qualitative or quantitative research. Thomas et al24 suggest that the aim of phenomenological research is to find meaning and understanding as opposed to causality and prediction; the criteria to evaluate the rigor of phenomenology is slightly different than what is used in a positivistic process of research. In this case, phenomenological research answers the research questions and the description of the lived experience provides fidelity to the knowledge claim about a lived experience.31 A relationship is thus established between researchers and the community to which the knowledge claim is presented. Furthermore, McClelland states the job of the researcher is to “seek an authentic telling of the experiences and what they mean from the perspective of the participant.”32(p. 178) In this study, methodological rigor was established by allowing participants to engage in the data analysis process by providing clarifying comments about their own descriptions and the common description formed by the analysis across all participants. Hence, CBPR and phenomenology were used to provide a rich description of the elements of everyday life or lived experiences of those being studied to describe how the visual art experience helped student artists and community members better understand the role of physical therapy in society. Themes and comments from the student artists are listed in Table 3. Students reported being skeptical about the art show initially, but eventually obtaining a deeper understanding of how they may transform society and improve patient care through this assignment. Although the experience was challenging for most students, it helped them confirm that they had chosen the right profession. All students reported being challenged in new ways and they were proud of their use of art to communicate and promote the physical therapy profession. Finally, all students had a plan for displaying their art after the show and ideas regarding an expanded role of advocacy and community engagement. Common themes also arose from the writings of the community members who attended the art show. The community reported gaining a better understanding of physical therapy as a profession and the role played by the profession in the community. Community members described PTs as healers and educators who solve complex movement problems and bring hope to those with movement disorders. Physical therapists were seen as medical professionals who specialize in movement by community members. Additionally, community members in attendance at the art show stated they would feel comfortable discussing personal movement and health problems with a PT after attending the art show. Community members reported feeling a deep connection to the physical therapy profession through the art and shared personal stories of encounters with the physical therapy professionals in the journals. See Table 4 for comments from the community members. This study used a sample of DPT students (n= 40) and community members (n= 30) to qualitatively explore the experiences of DPT students who created an art project for an art show on a Midwestern university campus. It also explored experiences of community members who attended the art show through reflective writing about the experience. The reflective writings of the DPT students and community members revealed a greater understanding of physical therapy as a profession or calling. Students learned about the participatory nature their work inspired among themselves and the greater community in attendance at the art show. Lessons about the profession of physical therapy were learned by all stakeholders. 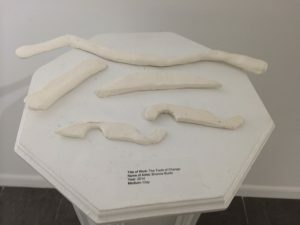 From the student perspective, there was a degree of initial skepticism regarding the assignment, followed by anxiety about what type of art to create for the art show. As students were provided with time and a safe space, levels of anxiety diminished and were reframed as excitement and anticipation for the show. The art assignment was viewed as a challenging but rewarding task. In their work with occupational and physiotherapy students, Smith et al15 reported student reactions to incorporating arts into the curriculum was initially met with anxiety because many therapy students had little time to do any artistic work prior to the arts assignment. Rabow 14 reported similar findings in the study on art and physicians. Students in our study were no different, with many experiencing an initial level of anxiety toward the assignment and finding it a challenge to incorporate art into the capstone coursework despite having adequate time to prepare. Students stated they eventually found the assignment to be relaxing and creating an art project provided a release for anxiety. Middleton and Drucquer11 reported similar findings and emphasized the importance of medical professionals utilizing art as a method to mitigate the everyday stress and demands of professional life. A local newspaper announcement and university communications advertised the art show. The community in attendance had an opportunity to talk with the DPT student artists about their work. Many stories were shared about physical therapy experiences. These stories diminished the distance between the DPT students and those who had suffered movement restrictions that limited full participation in life roles. Social issues regarding experiences with disability, insurance coverage, and the role of physical therapy in addressing social problems were brought into a public space. The DPT students and community members were able to discuss the biopsychosocial nature of the barriers to health and wellness that individuals face in the community. Stories and lessons regarding access to physical therapy care were exchanged between students and community members. The use of CBPR has been used to raise awareness of health and well-being in a community with the ultimate purpose to eliminate health disparities.29 HH have been demonstrated to connect medical and allied healthcare students to connect with and engage social problems in their lives.7,9,13-16,18,19 At the art show, potential solutions to health disparity were discussed in the context of social responsibility and awareness was raised about the opportunities of PTs to enhance the health and wellness of the community. A calling to the profession of physical therapy was identified and reaffirmed by students through the experience of participating in the art show. Students in this study felt the art show provided a portal for transition from student to entry-level clinician and a new way to communicate with others. Students reported previously losing the vision for why they enrolled in a DPT professional curriculum.6,15 Evans reported MH and stories of everyday experiences allow professionals to connect to patients on an embodied level, find connections to social problems, and reflect on their role in society as a professional.6 Smith et al15 echo the importance of MH in allowing students to reflect and verify a calling to a chosen profession. Students in this study reported a deepening of their understanding of the role of social responsibility and community engagement as part of one’s calling to a profession and a renewed confidence in their choice of vocation. Mission and vision statements of organizations provide lofty goals for transcending silos. The profession of physical therapy has been working to educate its own members and the community about physical therapy and what physical therapists do as professionals. Finding a connection between the profession of physical therapy, the world of academia, and the community is a challenge. Yet, HH appears to dismantle boundaries of the silos segregating professions and academia from the community. The incorporation of HH in educational programs may provide a means to better understand community needs and educate the community on the profession of physical therapy by illustrating the potential of physical therapy to transform society by enhancing movement to improve the human experience. Strengths of the study include a relatively large sample of reflections from DPT students (n=40) and community members (n=30) ensuring a variety of descriptions were obtained. Resonance around member comments reached saturation after 10 reviews of the common description for the art show. The investigators were experienced at conducting phenomenological research. A few limitations exist. The researchers acknowledge the results of this study may not apply to all DPT programs or communities. Staging an art show may not yield similar responses from students or the community whether it is done earlier or in the later stages in the DPT curriculum. Visual art is such a personal and public medium of expression. Meanings constructed from the art may vary depending on lived experiences of those creating and those viewing the art. A sense of reciprocity exists as a result of the experience. Researchers may consider investigating how HH influences observations skills of physical therapists and physical therapist assistants. Claims have been made that HH improves clinical observation skills allowing physicians, nurses, and occupational therapists to develop better differential diagnosis skills and holistic treatments skills.8,12,14,15 No such study has been conducted among physical therapists. With some form of direct access in all 50 U.S. states, it will be crucial for physical therapists to hone observation skills to be able to identify patterns of symptoms that require referral to other healthcare providers for optimal patient care. 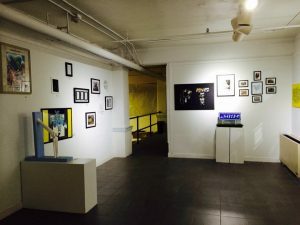 The visual arts and HH provide opportunities for deep connections to new ways of thinking about the human condition in physical therapy education and in society. The community learned about and gained new appreciation of the work of physical therapists through the experience of attending an art show. Students and community members were inspired and surprised by the power of visual art to explain the profession of physical therapy and the ways physical therapists can improve the human experience. Through the art show experience, students learned new ways to problem solve and consider alternative methods of expressing the essence of their personal beliefs about physical therapy and professional roles in transforming society. 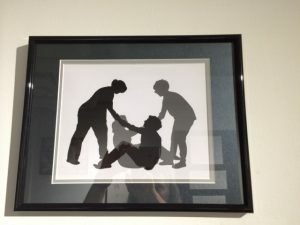 Through experiential education of an art show, the community learned about the profession of physical therapy and the role it may play in their lives when facing the distress of activity limitations preventing full participation in life roles. Community members learned strategies for advocating for their health needs by asking for PT referrals from their physicians if not provided. It appeared that a patient-therapist connection between the community and the profession was created. True service and the elimination of need cannot occur unless knowledge about a profession and society is made available in a translational manner. Ultimately, better serving our patients through the establishment of a deeper understanding of the patient-practitioner relationships is how the human condition is enhanced and society transformed. Bloom BS, Engelhart MD, Furst EJ, Hill WH, Krathwohl DR. Taxonomy of Educational Objectives, Handbook I: The Cognitive Domain. New York: David McKay Co. Inc.; 1956. Davis CM, Musolino GM. Patient Practitioner Interaction: An Experiential Manual for Developing the Art of Health Care. 6th Thorofare, NJ: Slack Incorporated; 2016. Prober CG. Heath C. Lecture halls without lectures – A proposal for medical education. The New England Journal of Medicine. May 6, 2012; 366(18):1657-1659. http://arabic.hadassahmed.com/media/1904201/LectureHallsWithoutLecturesAProposalforMedicalEduc.pdf. Published May 3, 2012. Accessed May 14, 2016. Anthony ML, Templin MA. Nursing faculty teaching in the general education sequence: the value of liberal arts as a component of professional nursing practice. 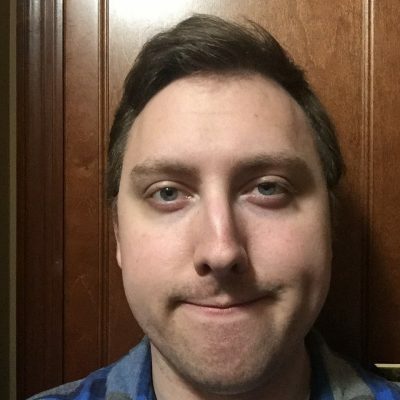 J Nurs Educ. 1998;37(7):321-323. Domholdt E. 2007 Pauline Cerasoli Lecture: Sins of the Professional Programs. J Phys Ther Educ. 2007;21(2):4-9. Evans M. Reflections on the humanities in medical education. Medical Education. 2002;36:508-513. Girardeau RP. DOMAIN3 Do the liberal arts belong in EMS education? Educator Update. July 2012;16-19. http://connection.ebscohost.com/c/articles/77665155/do-liberal-arts-belong-ems-education. Published 2012. Accessed May 15, 2016. Kirklin D, Duncan J, McBride S, Hunt S, Griffin M. A cluster design controlled trial of arts-based observational skills training in primary care. Medical Education. 2007;41:395-401. doi.10.1111/j.1365.2929.2007.02711.x. Lepicard E, Fridman K. Medicine, cinema, and culture: A workshop in medical humanities for clinical years. Medical Education. 2003;37:1039-1040. Macnaughton J. ‘Arts and humanities’: a new section in Medical Education. Editorial. Medical Education. 2002;36:106-107. Middleton J, Drucquer M. Arts and medicine in postgraduate medical education. Teaching Exchange. 2006;621-625. Perakis CR. A humanities orientation to physical diagnosis. Medical Education. 2003;37:1038-1039. Pierce ER. The liberal arts connection (career education, career skills, professional competence). Am J Occup Ther. April 1984;38(4):237-244. Smith S, Molineux M, Rowe N, Larkinson L. Integrating medical humanities into physiotherapy and occupational therapy education. Int J Ther Rehabil. September 2006;13(9):421-427. Whitham R, Rose E, Cain R. Arts-based learning: is it worthwhile? Medical Education. 2012;(46)436-437. doi: 10.1111/j.1365-2923.2011.04200.x. Yerksa EJ. Liberal arts: the foundation of occupational therapy education. Am J Occup Ther. 1986;40(3):153-159. Hurwitz B. Medicine, the arts and humanities. Clinical Medicine. 2003;3:497-8. Jones T. Wear D, Friedman LD. Health Humanities Reader. Rutgers University Press; 2014. American Physical Therapy Association (APTA). New Vision of the Physical Therapy Profession Adopted. June 27, 2013. http://www.apta.org/PTinMotion/NewsNow/2013/6/27/NewVision/. Published June 27, 2013. Accessed July 29, 2016. American Physical Therapy Association (APTA). Vision Statement for the Physical Therapy profession and Guiding Principles to Achieve the Vision. http://www.apta.org/Vision/. Published 9/9/2015. Accessed July 29, 2016. Chomsky N. Language and Mind. New York: New York University; 1972. Porter R. The Greatest Benefit to Mankind. London: Harper Collins; 1997.
van Manen M. Researching Lived Experience: Human Science for an Action Sensitive Pedagogy. 2nd ed. London, Canada: Althouse Press; 1997. Thomas SP, Pollio HR. Listening to patients: A Phenomenological Approach to Nursing Research and Practice. New York, New York: Springer Publishing Company; 2002. Dahlberg K, Drew N, Nyström M. Reflective Lifeworld Research. Lund, Sweden: Studentlitteratur; 2001. Giorgi, A. An application of phenomenological method in psychology. In: Giorgi A, Fischer CT, Murray EL, ed. Duquesne Studies in Phenomenological Psychology. Vol. 2. Pittsburgh PA: Duquesne University Press; 1975:235-260. Giorgi, A. The theory, practice and evaluation of the phenomenological method as a qualitative research procedure. Journal of Phenomenological Psychology. 1997;28:235-260. Israel BA, Eng E, Schulz AJ, Parker EA. Methods in Community-Based Participatory Research for Health. San Francisco, CA: John Wiley & Sons, Inc; 2005. World Health Organization (WHO). International Classification of Functioning, Disability and Health. http://www.who.int/classifications/icf/en/. Published May 22, 2001. Accessed July 29, 2016. McClelland J. Sending children to kindergarten: A phenomenological study of mothers’ experiences. Family Relations. 1995;44(2):177-183. Polkinghorne D. Generalizations and qualitative research: Issues of external validity. In: Linden J, Szytek P. eds. Validation of Knowledge Claims in Human Science. Lyon: L’Interdisciplinaire; 2003:121-163. Merleau-Ponty M. Phenomenology of Perception. New York, NY: Routledge Classics; 1958. Dr. Sue Klappa PT, PhD, is a professor in the Doctor of Physical Therapy Program at Briar Cliff University in Sioux City, IA. She completed her PhD in Education, Curriculum & Instruction from the University of Minnesota with a focus on community engagement. 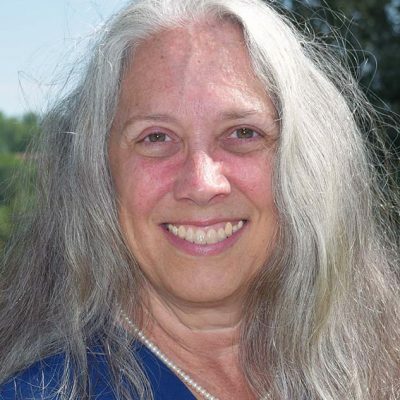 Sue earned her Masters of Physical Therapy degree from St. Catherine University and also a MA in physical education with emphasis in cardiac rehab from the University of Minnesota. Dr. Klappa is a PT educator and clinician who has practiced physical therapy and presented internationally. She has a special interest in global and local public health. Dr. Klappa has had six tours of service to Haiti after the 2010 earthquake. She has also led and facilitated many service learning/community engagement experiences for student PTs and PTAs in the Dominican Republic, Venezuela, Honduras, Mexico, and Haiti. Dr. Klappa’s research interests explore how inter professional collaboration, global health work, and international community engagement influence the formation of professional identity among physical therapists. 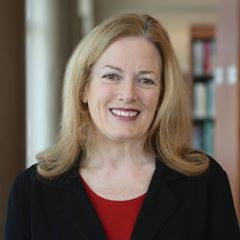 Through her work, Dr. Klappa believes the humanities are crucial to understanding the human condition so that we may transform society to become complete human beings who are able to connect with others more deeply. Yvonne Beth Alles, DHA is a diagnostic instructor for the Kent Intermediate School District in Grand Rapids, Michigan and works with the Health Sciences Early College Academy to provide Career and Technical Education to high school juniors and seniors. Yvonne was awarded a Bachelor of Arts (Honors) in Health Services Administration, and a Masters in Business Administration with a healthcare emphasis from Davenport University. She received her DHA in Healthcare Administration from the University of Phoenix. Before coming to Kent ISD, Yvonne worked at Davenport University where she served as the Department Chair of Allied Health, including the areas of Medical Assisting, Health Services Administration, Medical Case Management, and Occupational Therapy. Yvonne has also worked at Spectrum Health in Grand Rapids, Michigan, as a healthcare administrator in the Healthcare Information Management department and as a medical language specialist. Yvonne’s current research explores the development of career exploration and soft skills to prepare beginning students for success in healthcare careers. As the healthcare system becomes increasingly mechanized, Yvonne believes that emphasis on the humanities will be an area which must be included while considering career options. For example, music therapy has been shown to improve communication with Alzheimer’s patients. Narrative medicine is another area of interest for Yvonne secondary to her strong background in health information management.